Then, having bowed to the right and the left one stands in one's place and listens to the psalms and prayers read in church, but one does not say to oneself other prayers of one's own choosing nor read them according to books different from the church chanting, for such things the holy Apostle Paul condemns as having forsaken the assembly of the Church (Hebrews 10:25). Prostrations and bows should not be made according to one's inclination, but according to the regulations of the holy apostles and holy fathers, namely; at the reading of the Trisagion (“Holy God”), “O come let us worship,” and the threefold “Alleluia,” one makes upon himself the sign of the Cross and bows three times; likewise at the reading: “Vouchsafe, O Lord,” as well as at the beginning of the Great Doxology (“Glory to God in the highest,”), and after the words of the priest: “Glory to Thee, O Christ God, our hope.” After each exclamation of the priest, and also at the reading by the reader of “More honourable than the Cherubim,” one makes the sign of the Cross and a bow. At Matins or Vigil, when “The Theotokos and Mother of the Light let us magnify in song' is exclaimed, we make a prostration. On Sundays, and likewise from the day of Holy Pascha until Vespers on the day of Pentecost (i.e., the “Kneeling Service”), and also from the day of the Nativity of Christ until Theophany, and likewise on the day of Transfiguration, and the Exaltation (except before the Cross), the Holy Apostles utterly forbid kneeling and prostrations, concerning which St. Basil the Great testified in a letter to the Blessed Amphilochius, Thus also the First and Sixth Ecumenical Councils established: for Sundays and other feasts of the Lord serve as reminders of our adoption by God, according to the word of the Apostle: “Wherefore thou art no more a servant, but a son” (Gal. 4:7); for it is not proper for sons to make servile adoration. 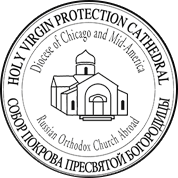 Customarily, Orthodox Christians do not kneel, heads upright, but at the words of the priest (or deacon): “Again and again on bended knee,” and the rest, they bow the face to the ground; the custom of kneeling at will, folding the arms, and beating oneself on the breast comes from the Western heretics, and in the Orthodox Church it is not allowed. Orthodox Christians, in accordance with the Church rule, make prostrations at the appointed times, bowing prone upon the ground and again standing on the feet. In church, whenever the people are blessed with the Cross, or the Gospel, with an icon or the chalice, they all make the sign of the Cross, bowing the head; but when blessed with candles, or the hand(s), or censed, Orthodox Christians ought not to make the sign of the Cross, but only bow the head. However, during the week of Holy Pascha when the priest censes with the Cross in his hand, then all make the sign of the Cross and answer: “Truly He is risen!” In this way ought we to distinguish between reverence toward holy things and toward persons, although they be of priestly rank. When receiving a blessing from either a priest of a bishop, a Christian kisses the right hand of him who bestows the blessing, but does not make the sign of the Cross before doing so. It is not proper to kiss the left hand of clergy, for this is a Jewish usage. According to the teaching of the Holy Fathers, the sign of the Cross should be made in the following manner: the them and first two fingers of the right hand are joined at their tips and the other fingers folded across the palm. We then touch the brow, the belly, and the right and left shoulders, and make a slight bow. Of those who sign themselves with all five fingers, or who bow before finishing the Cross, or simply wave their hand in the air or before their breast, St. John Chrysostom says: “the demons rejoice at these mad gestures.” On the other hand, the sign of the Cross, properly made with faith and reverence, terrifies the demons, calms sinful passions, and calls down divine grace. 1. At the middle of the Six Psalms, at Alleluia, thrice. 2. At the beginning of the Creed. 4. At the beginning of a reading from Holy Scripture: Gospel, Epistle, or Parable (at Vespers, Royal Hours). 1. When entering or leaving a church – thrice. 2. At each petition of the ecteniae. 3. At each exclamation of the priest offering up glory to the Holy Trinity. 7. During the words: “Alleluia,” “Holy God,””O come let us worship,” and after the exclamation “Glory to Thee, O Christ God,” before the dismissal -thrice. 8. At the canon, at the first and ninth odes, at the first refrain to the Lord, the Mother of God, or the saint. 9. 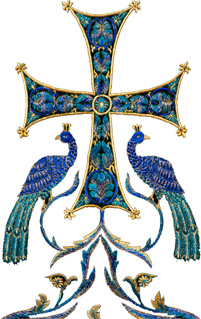 After each sticheron (at which time the choir that has finished chanting makes the sign of the Cross). 10. At the Litia, after each of the first three petitions we sign ourselves and bow three times; after the remaining two petitions we sign ourselves and bow once. 1. During fasts, on entering and leaving the church, thrice. 5. After “It is truly meet,” or its substitute megalynarion. 8. During the Great Fast, at Great Compline, at the chanting of “O most holy Lady,” at each verse; at the chanting of “O Theotokos and Virgin, rejoice,” and the rest, at Great Lenten Vespers, three prostrations. 10. During fasts, at the concluding chanting: “Remember us, O Lord, when Thou comest in Thy kingdom,” - always three prostrations. 5. At the words of the deacon: “And unto the ages of ages” (after “For holy art Thou, O our God”). 3. During Ecteniae by the choir that chants the responses. The making of the sign of the Cross and bows should be done after the chanting is finished, and not during the closing words. On Sundays; from the Nativity of Christ through Theophany; from Pascha until Pentecost Sunday; on the day of Transfiguration; and on the Exaltation of the Cross (except three prostrations before the Cross). Prostrations cease from the Entry at the Vespers of a feast, until “Vouchsafe, O Lord,” at Vespers on the day of the feast itself.